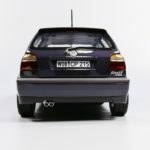 If you follow me via the DiecastSoceity.com forums you know another one of my passions are Volkswagens. Since I acquired my license in my teens it has been the only brand (along with Audi) that I’ve owned in 1:1 form. 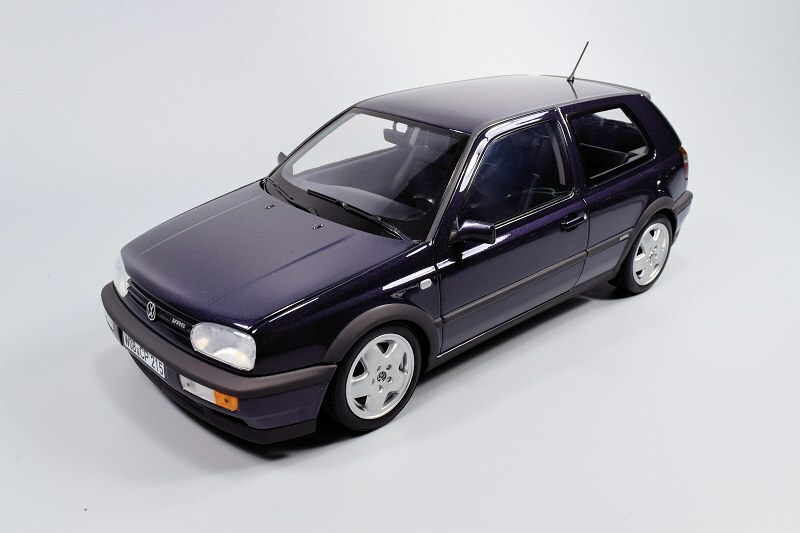 My first car purchased in 1995 was the MKIII Golf GTI 2.0L 8v in Flash Red. Tragically I wrote her off a year and half later. 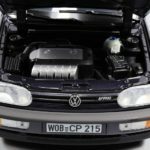 During this period there were rumors that Volkswagen Canada would introduce the famed VR6 motor into the North American Golf. 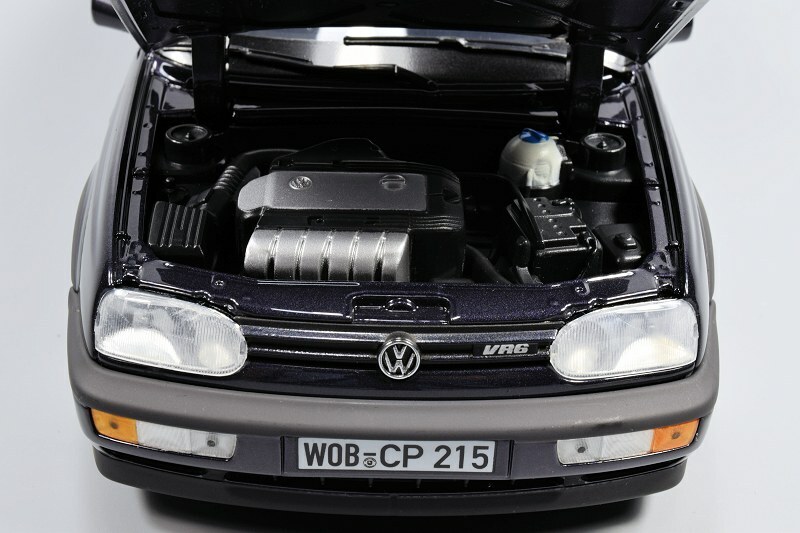 If you know Volkswagen and the history behind the VR6 motor, you know the tune it sings is music to the ears. My dream came true, a year later I was the proud owner of a 1997 Golf VR6 GTI. 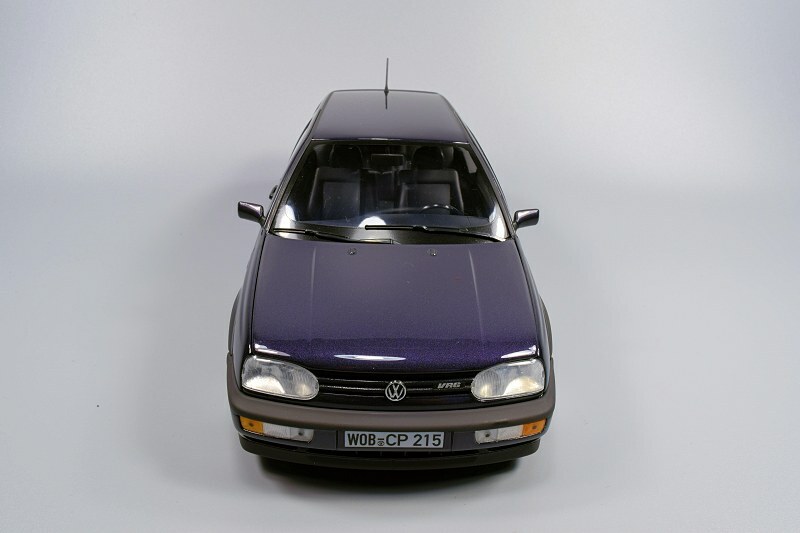 The colour was named Windsor Blue metallic, very similar to the colour in the example scale model here – Dusty Mauve. Soon after I added a Vortech Supercharger, H&R coil-over suspension, BBS wheels, and a host of other interior goodies. She ran like a bat out of hell. Oh the memories! Definitely lived up to the Pocket Rocket name. 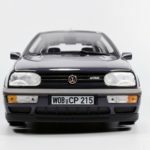 I think you had enough of my reminiscing, on to the more important things like the review of the new 1:18 Norev MKIII Volkswagen Golf VR6. 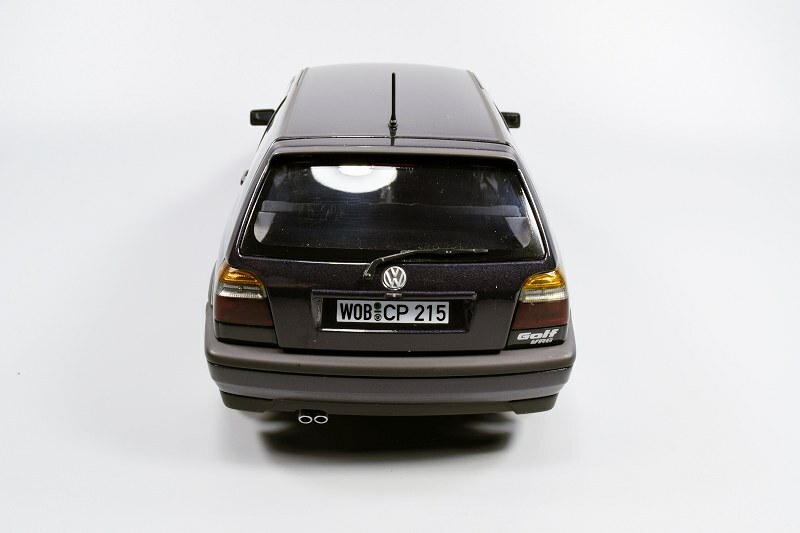 Until now the only option in 1:18 scale Golf VR6 came from OttOmobile. No offense to OttOmobile, as they executed a great piece, but nothing can replace a diecast model with opening parts, and it is cheaper too! 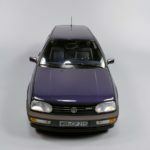 As mentioned, the exterior colour is OEM Dusty Mauve. Norev paint is slightly above average, it does show some orange-peel effect, though the flow of paint is consistent throughout. 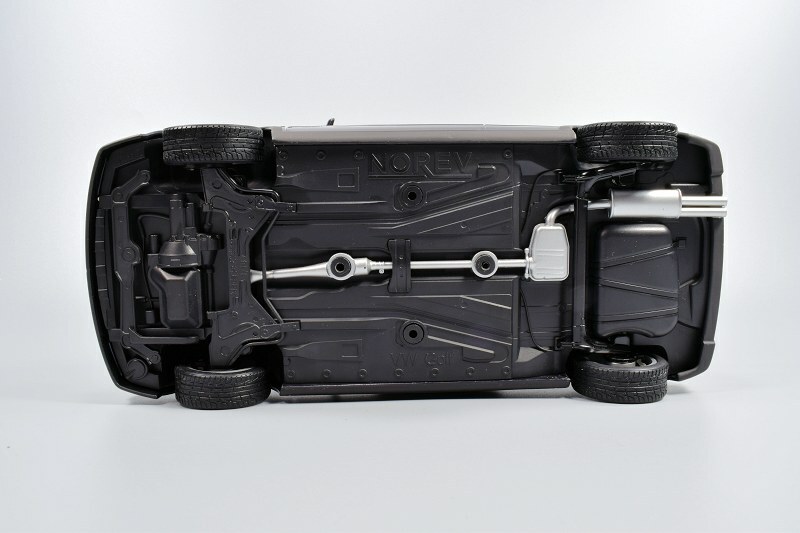 I like how Norev executed the Flat Black rubber moulding that surrounds the entire car – very authentic. Panel gaps are very good throughout as well. On the flip side the shutlines lines front and rear could use a little help. Norev’s attention to detail for a 60 Euro model is amazing. The overall shape mirrors the original car well. If you don’t believe me, take a look at the photo evidence. 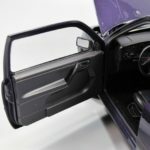 What is impressive is the attention to small detailing, including all exterior badging, the transition from metallic to flat paint, and the added Black moulding around the exterior windows and door openings. Truly fantastic! I think the only miss is the painted side indicator lights, I wish they were indented in plastic. 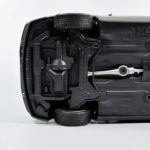 Front of the Golf VR6 features solid plastic bits for all cooling elements. Based on price point, Norev’s execution using solid bits provides a great end result. Even the detail work within the headlights mirrors the original car well. Rear features period correct tinted taillights. Bumper lines and badge work are excellent too. Even the angle of the dual exhaust tips is accurate to the period, though I think the overall diameter could have been slightly larger. 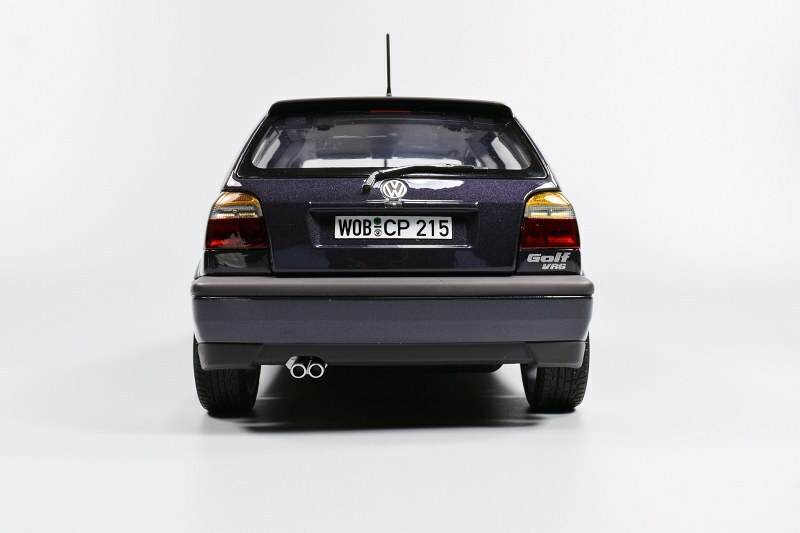 The rear hatch is accessible with the Golf VR6. Operation is flawless. 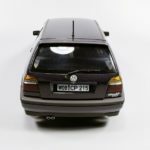 The added bonus, the upper hatch deck and storage compartment is fully wrapped in flocking material, true to the period. The hatch deck is functional too. Well done Norev! The motor is accessible. It is nice to see the lump sum VR6 block and head when opening the hood. A win over the OttOmobile piece for sure. Personally I was very disappointed in the overall method Norev used to execute this. Under close inspection you see how truly basic and poor the detail is. 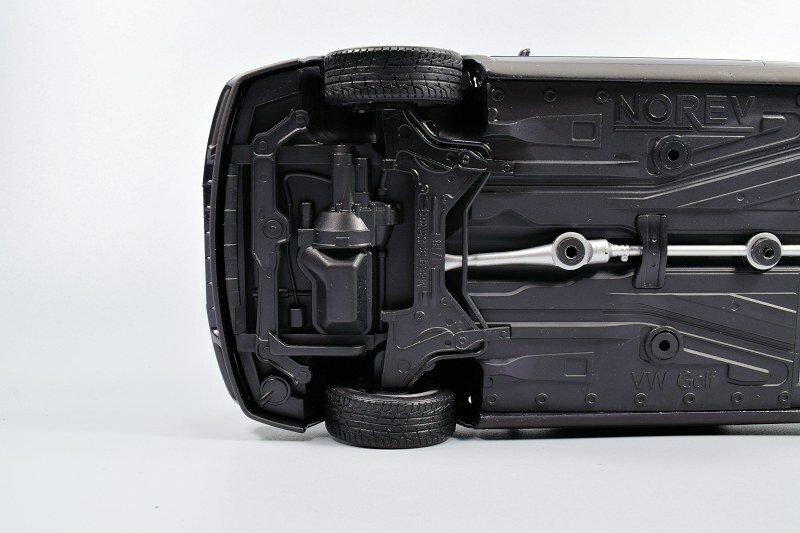 Basically Norev takes a flat piece of plastic and attaches bits and pieces of various dimensions to create what is supposed to be the motor and its surroundings, almost Lego-like in execution. 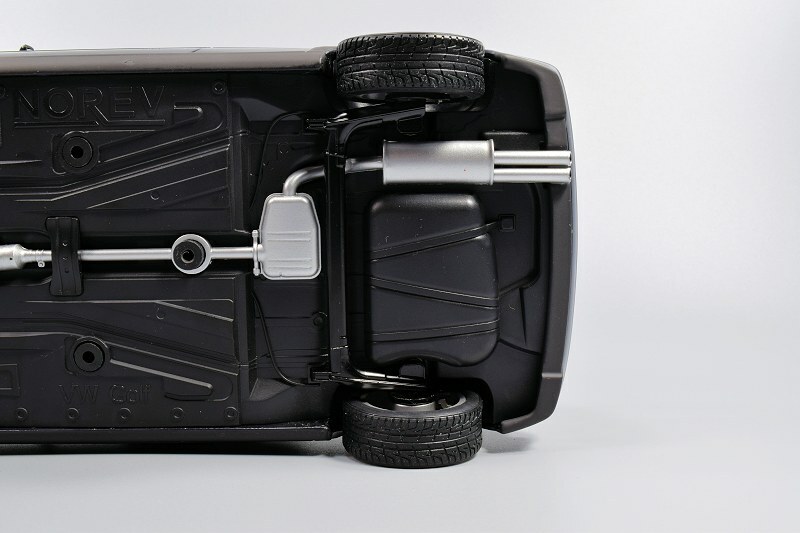 Undercarriage detail is present. 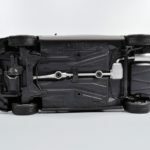 Exhaust workings and basic elements of the front and rear suspension components are available for view. The wheels and tires are average at best. The entire package is here, we have the rims, tires, rotors and calipers. It just doesn’t have the spark I like to see. 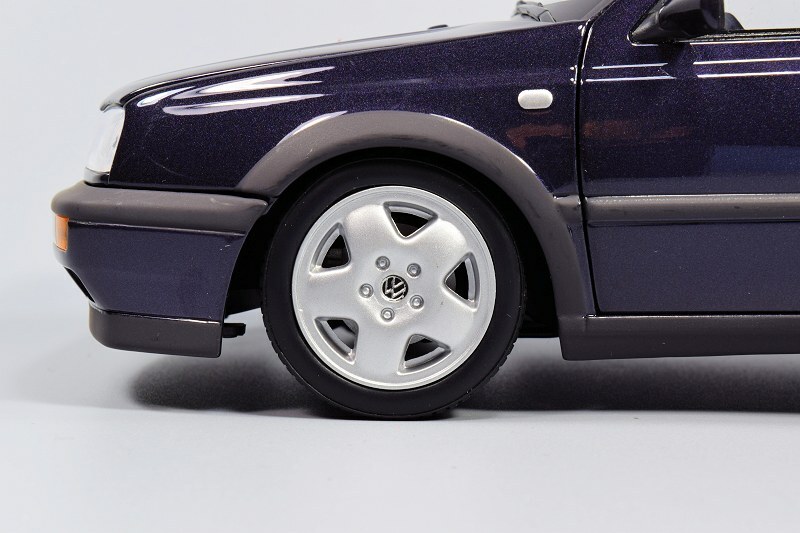 Also the front stance is too low based on the original car. 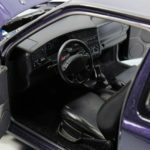 Inside the Golf VR6 interior is well appointed. All elements are present and detailed. 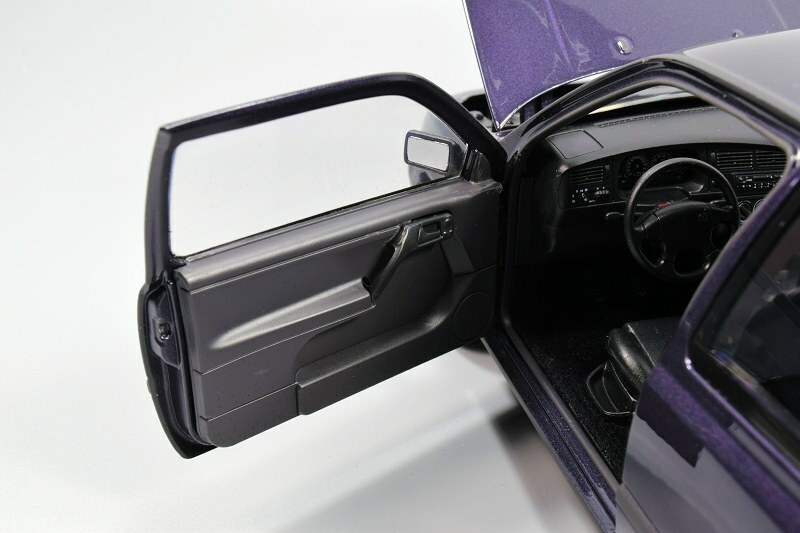 Though the level of execution isn’t to the tens, bonus points go to Norev for including a full carpeted interior. The biggest miss interior wise is the shape of the shifter boot, not accurate to the original – too big and lumpy. 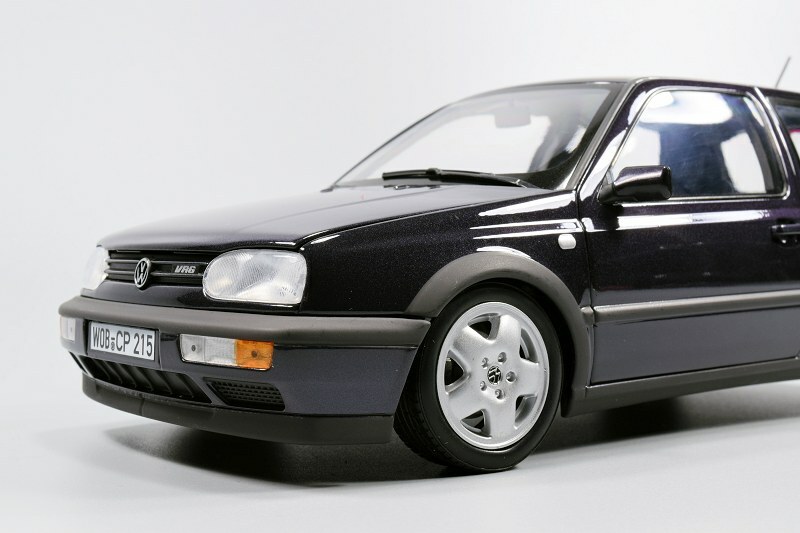 I know most of these Volkswagen scale replicas don’t mean much to most unless you are an avid fan of the brand. 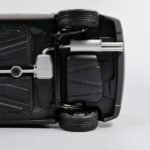 Should you upgrade from the OttOmobile piece? Definitely! Is the Norev model perfect? By no stretch of the imagination. Where the model does excel is exterior detail, simply delicious for the 60 Euro asking price. On the flip side, the biggest fail is the motor. 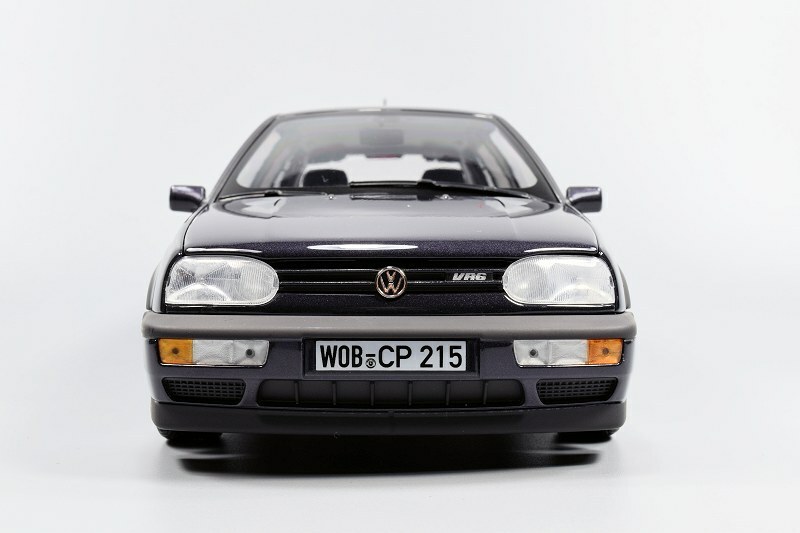 This Volkswagen Golf VR6 will be a perfect base for someone who likes to modify models. And based on my opening paragraph, modifying Volkswagens in any size goes hand in hand. Enjoy the pics! 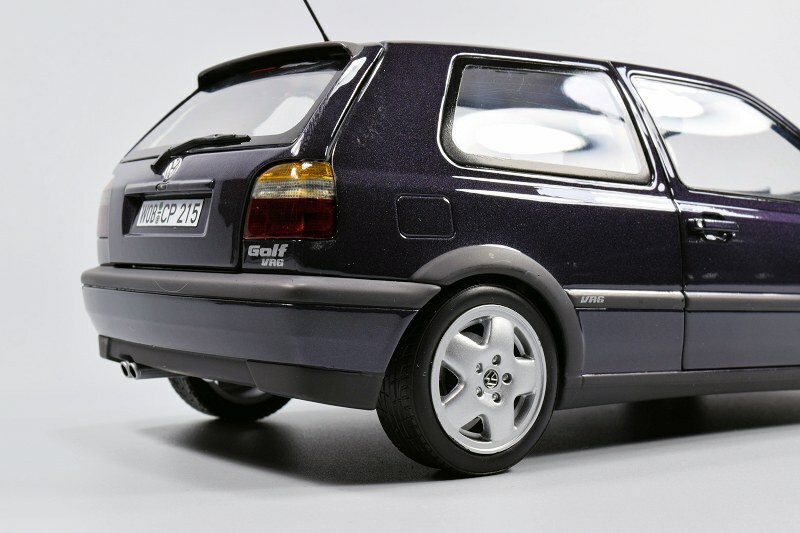 4 Responses to "REVIEW: Norev MKIII Volkswagen Golf VR6"
Love this car had a vr6 back in the day as well, with a vf supercharger to boot, nice review, i hope norev didnt base the “mulberry” off a vw color cause its not even close. Don’t believe its available. You would require a custom piece. There are a few good customizers found in the DS forums. Register and ask your question there!